What other characters can you play as? I saw somewhere something about them redoing the SMB sprite for Peach. Also can't wait, so excite! And probably the only game I'll buy the rest of the year for fear of layoffs. Are they the Amiibo unlocks? I saw in one of the videos here that there would be over 50 Amiibo supported. I believe they've said there's other ways to unlock them, but Amiibos are the shortcut. I'm just glad I bought (the equivalent of) a second PS4 to unlock that shortcut option. You can play as amiibo characters if there's a mystery box power up in a level, but you can only place a mystery box in a level if you have the amiibo. So anyone can play with the characters in levels that use them, but only people with the amiibo can create and share those levels. Do "secondary" characters have their typical abilities, like Luigi's higher/floatier jump, or Peach's horizontal float? Or are they just reskins of Mario? All the costumes I've seen in videos have just been reskins of Mario. I have also seen videos where the creator has said "I'm not going to hit this block, because the contents are still embargoed." So there's a chance that some of them will change up the gameplay, but I wouldn't count on it. "Now that Mario has a helmet, he'll be safe from attacks from above"
Whoa whoa whoa: beetle helmet?! Is that a brand new mechanic?! Yep. You can also wear a spiny helmet. They added all kinds of weird powerups to this one. Anyone else pre-order this through Amazon for a digital code still waiting for their code to pre-load? Getting a little annoyed, as this was a gift for a friend... and now I look like the guy who doesn't have a code to give. I preordered a physical copy from Amazon for release-day delivery. Hoping they come through with it! I'm sure Clock is cool with waiting. I wouldn't stress it too much at this point. It's the first time Amazon and Nintendo have done preorders for digital stuff, and I'm sure there'll be some hiccups. Isn't your release date 9/11? Wouldn't you still have a few days to wait for that code? Not sure how it works up there, but I'd be expecting to get the code on the day of release. I'm not sure about ordering through Amazon, but if you preorder from Nintendo's website, they send you the code a few days early so you can preload. I did it with Smash and Splatoon, and it works well. Apparently that is not the case with Amazon. I swear to Buddha and however many lamas there have been that it said they would be distributing codes... but it would seem, after talking to 2 different customer service reps that that is no longer the case... so as soon as I have the code on Midnight of the release morning, it'll be PMed. I definitely saw the whole "code will be emailed to you 72 hours before release" notice on Amazon as well @Demosthenes. I never got around to preordering on Amazon, looks like I'll just give up the potential $1 in points on my Amazon rewards card and get it directly from the eShop. The hardest part for me is going to be seeing 'how pretty' the Mario Wii(U) skin looks in this. I have come so close to getting that title so many times... I will be getting the Mario/Luigi combo pack when it comes out, but it's going to be a long wait between now and then I think. The Inkling amiibo lets you turn into an Inkling, complete with squid form!!! That's really awesome. They also retain the sounds for the character, which I hope is true of the other amiibos. Have we seen any of the amiibo skins in a tile set other than original SMB? 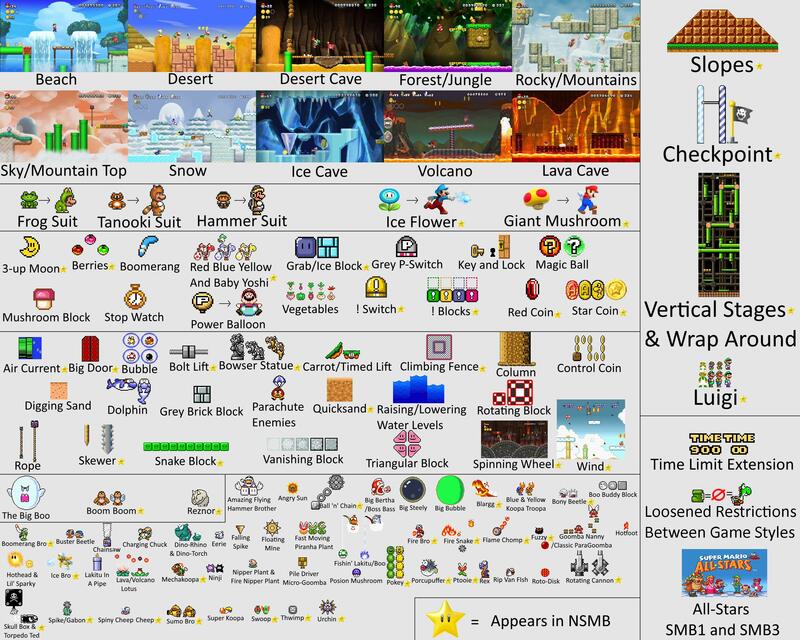 I'm wondering, for example, if there's a SMW version, etc. As near as I can tell, the amiibo support is all only in the 8-bit theme. It's in the mail! It's on the way!